The Section 27 Deposit Release procedure can allow a vendor to gain access to a deposit before settlement. However, the process is not as simple as it may at first appear. Here is what a vendor should do in order to have the best chance of getting hold of the deposit before settlement. NOTE: If you have “clear title” with no mortgages or caveats registered your property, go direct to STEP 4 below. It’s possible to get the deposit before settlement – sometimes. Having a good understanding of the procedure will help you to decide whether or not seeking early release of the deposit is something you really want to do. Some vendors begin the Section 27 Deposit Release process, not because they want the deposit released early, but because their real estate agent wants them to have the commission released. Or, it may be that the vendor simply believes that the money is better in their pocket than sitting in an estate agent’s trust account. NOTE: No matter how important it may be for you to have the deposit released early, it is unlikely to be released before settlement if the amount required to pay out an existing mortgage is 80% of the sale price or higher. One problem that regularly takes vendors by surprise is the need to apply the deposit to the paying out of the mortgage over the sold property. For example, a property sells for $500,000 and a deposit of $50,000 is held in the estate agent’s trust account. The amount to pay out the mortgage over the property is $490,000. This means that the balance of the sale proceeds ($450,000) will not be sufficient to pay out the mortgage without also dipping into the deposit funds. In such circumstances the vendor might be struggling at settlement time if the deposit had been released and spent before this problem became apparent. A vendor should prepare for a situation where the deposit, or part of it, may be required at settlement. Unfortunately, most banks don’t calculate the final amount required to discharge the mortgage until the day before settlement, so this problem may not become apparent until it has become quite urgent. Some estate agents become quite unco-operative when asked to deliver deposit funds to settlement, usually because of a misunderstanding of the law relating to estate agent trust accounts, but sometimes because the estate agent just doesn’t want to go to the trouble. If you know that some of the deposit money will be needed to discharge your mortgage, arrangements for the use of deposit money at settlement (including electronically transferring of the deposit funds into our trust account) must be made with the estate agent well before settlement. So, before moving to STEP 3, a vendor must consider whether early release may create cash problems closer to settlement, and/or whether commencing the Section 27 Deposit Release procedure will be a waste of time and an exercise in frustration. If there is no mortgage and no caveat over the property, it is a simple matter of confirming this to the purchaser by way of a statement in the Section 27 Deposit Release Statement. However, if there is a mortgage or caveat over the property it will be necessary to obtain information about these in order to fill up the fields in the Section 27 Deposit Release Statement. The information required is set out in Section 27(3)(a) and Schedule 1 of the Sale of Land Act 1962. Obtaining the necessary information is usually the most frustrating part of the Section 27 process. Who provides the necessary information? You, as the owner and vendor of the property, are the person who is expected to provide the information required under Section 27 of the Sale of Land Act (see our page titled, “Section 27 Deposit Release – How to Understand the Deposit Release Process” for more on this). In reality, very few vendors have precise and up-to -ate details available to them, and so they must ask their bank for this information. A common response from a bank employee who is asked for details of a customer’s loan for the purposes of paying out their mortgage is something along the lines of, “Your conveyancer should be helping you with this.” Of course, when the client asks us about details of their home loan we have to explain that we do not have details of their loan account, and even if we contact their bank, the bank will tell us that it is a breach of the customer’s privacy to disclose such information. 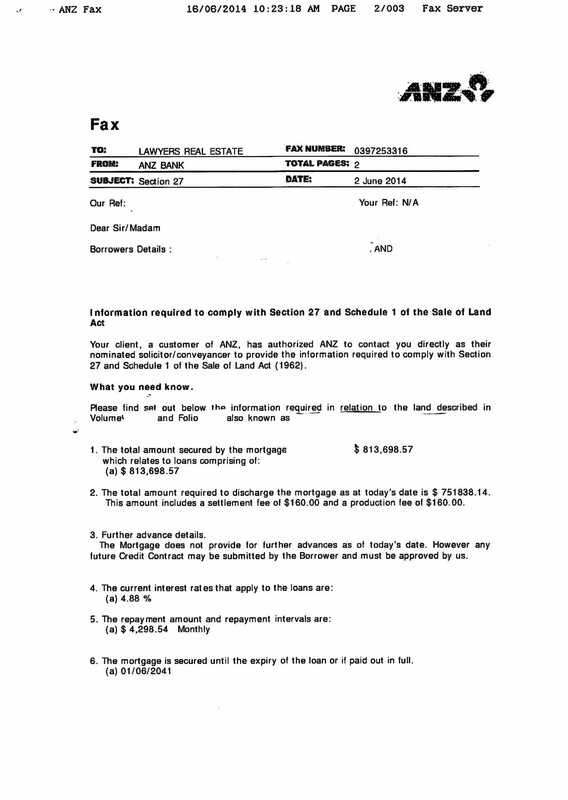 The information obtained from the mortgagee (lender/bank) is now entered into the Section 27 Deposit Release Statement. Of course, it is possible for a vendor to obtain the required information from documents the vendor has, or to obtain the information over the phone from the lender. However, the purchaser’s legal representative will not accept a Section 27 Deposit Release Statement that is not supported by a Section 27 letter on the mortgagee’s letterhead, or something similar. This is often the next stage of frustration for a vendor seeking release of the deposit. We have created a separate page with information on how you can obtain the required Section 27 Deposit Release information from your bank or mortgage broker. See “Section 27 – How to Obtain a Bank Confirmation Letter“. If you have “clear title” with no mortgage or caveat registered against your property, just print off the Section 27 Deposit Release Statement, write “NIL” on the dotted line at clause 1.1, rule a line through the words “The property is now affected by the following caveat/s” at clause 2, sign and date the form, and hand it to your estate agent or send it to us. If there is a mortgage or caveat over the property, download the Section 27 Deposit Release Statement and complete it (or better still, have your bank manager or mortgage broker complete it for you) using the information obtained in STEP 3 above. Don’t forget to sign and date the Section 27 Deposit Release Statement as confirmation that its contents are true and correct to the best of your knowledge. The completed and signed Section 27 Deposit Release Statement must now be served on the purchaser. The quickest and easiest way to arrange this is to give the completed Section 27 form to your estate agent, and instruct the estate agent to serve it personally on the purchaser as soon as the Contract of Sale has been executed by both parties. The estate agent should be instructed to send a copy of the Section 27 Deposit Release Statement to us, endorsed with the time and date on which it was served on the purchaser, so that we can monitor the 28 day count-down. Remember, in most cases a purchaser’s lawyer/conveyancer will automatically object to the early release of the deposit by way of a formal letter, fax or email. Such an objection immediately cancels the 28 day count-down. This means that the deposit will not be released before settlement unless and until the purchaser has signed the acknowledgement at the foot of the Section 27 Deposit Release Statement, and the document has been delivered to the deposit stakeholder (i.e. your estate agent) to authorise release of the deposit. How to choose Conveyancer or Lawyer? When you engage us to complete your conveyancing, the matter will ordinarily proceed as follows: Preliminary - Obtain Pre-Purchase Assistance via our automatic email facility. When you engage us to complete your conveyancing, the matter will ordinarily proceed as follows: Pre-Sale Matters, Exchange of Contracts then Completion. When you are moving house it is always difficult to remember all of the things that need to be done during the lead-up to THE BIG DAY. Below is a list of "things to do" in the form of our document "Countdown To Moving Day". You can download this list and use it to fill in your calendar so that you will be prompted as moving day approaches. All visitors to this website are advised to visit our Disclaimer regarding the limited use of information provided on this website, and our Conveyancing Section for conveyancing consumer information.